With NFL Week 1 kicking off in just a few days, here’s a preview of every game, including major offseason moves each team has made and links to our game predictions and most popular matchup analysis data. If you want access to all our best NFL predictions, tools, and data this season, check out our NFL betting picks, NFL pick’em pool picks and NFL survivor pool picks, or read an overview of our premium content for football. The 2018 NFL season kicks off with a rematch of last year’s Divisional Round matchup between the Falcons and the defending Super Bowl Champion Eagles. Philadelphia returns most of their championship personnel from last year, but injuries are a major story heading into Week 1. Super Bowl MVP Nick Foles will start at quarterback, as Carson Wentz continues to recover from a torn ACL and LCL suffered in Week 14 last year, and No. 1 wideout Alshon Jeffery is also out due to a shoulder injury. Running back Jay Ajayi has also missed time leading up to Week 1 with a lower-body injury. Foles was efficient, if unspectacular, vs. the Falcons last year, throwing for 246 yards and completing nearly 77 percent of his passes, with no touchdowns or picks. The Falcons defense quietly ranked sixth best in points allowed last season, so this matchup could be a challenge for Philly if they aren’t healthy. With the transition at offensive coordinator from Kyle Shanahan to Steve Sarkisian last year, Falcons quarterback Matt Ryan regressed considerably. He went from 9.3 yards per attempt in his 2016 MVP season to just 7.7 yards per attempt last year. Atlanta is hoping a year in the system and the addition of first-round wideout Calvin Ridley will be beneficial. Ridley played under Sarkisian briefly at Alabama, so his transition should be eased a bit. The trio of Ridley, Julio Jones, and Mohamed Sanu presents a formidable challenge for the Eagles defense, but they’re hoping to ramp up the pass rush with the addition of Michael Bennett and a year of seasoning for 2017 first-round pick Derek Barnett. Philly’s deep secondary is also well-qualified to defend a deep wide receiving corps. This NFC South showdown has had the largest spread on the board for much of the offseason due in large part due to the absence of Bucs quarterback Jameis Winston (suspension). Tampa Bay is fortunate to have experienced backup Ryan Fitzpatrick, who went 2-1 in three starts last year, but he has also had a sub-60 percent completion rate in three straight seasons. Fitzpatrick has thrown 136 interceptions in 133 career games, so there should be opportunities for a Saints defense that markedly improved last year and finished 11th in the league with 1.4 takeaways per game. While the Bucs drafted running back Ronald Jones II in the second round, they’re expected to go with Peyton Barber and his career 4.0 yards per carry as their starter. The Saints have a major suspension of their own, as Mark Ingram is out for four games due to PEDs. That means 2017 Offensive Rookie of the Year Alvin Kamara could see a full workload, which is a concern for a Bucs defense that allowed 4.3 yards per carry last season (24th in the NFL). Of course, the Bucs were even worse against the pass, allowing the second most yards per attempt, but they have tried to address those issues by adding Vinny Curry, Jason Pierre-Paul, and first-round pick Vita Vea to their defensive line. They could have a tough time making a difference, though, considering Drew Brees was sacked only 20 times in 536 dropbacks last season. Brees also led the league with a 72 percent completion rate and 8.1 yards per attempt. He tore apart the Bucs defense with surgical precision at home last year, completing more than 81 percent of his passes with 263 yards and two scores. Former Giants head coach turned Jaguars VP Tom Coughlin returns to face his former team for the first time in Week 1. The Jaguars were the AFC’s biggest breakout team in 2017, falling just short in the AFC Championship vs. New England. The team found success with an elite defense (17.7 points allowed, third best) and a conservative offense led by Leonard Fournette. The recipe seems unlikely to change this year, especially after Jacksonville lost their top three wideouts from last year due to free agency and injuries. New York finished in the middle of the pack last year with 4.2 yards allowed per carry, and the pressure will be on nose tackle Damon “Snacks” Harrison and former Rams linebacker Alec Ogletree to stuff the middle. The Giants hope to take off on offense this year with new head coach Pat Shurmur and the additions of first-round running back Saquon Barkley and three new starters on the offensive line. That’s in addition to Odell Beckham Jr.’s return from injury, and last year’s breakout for 2017 first-round tight end Evan Engram. Eli Manning had a pitiful 6.1 yards per attempt last year, but he has the support to improve that number this season. Of course, Manning also has more interceptions than games played in his career, something the Jags defense will try to take advantage of again after finishing second in takeaways in 2017. Former Patriots offensive coordinator Bill O’Brien faces his former team for the fourth time since he took over as head coach in 2014. The Patriots are 4-0 in those matchups, scoring an average of 31 points per game. Much of Houston’s success during O’Brien’s tenure has been due to their defense, but they couldn’t stop teams from connecting on big passing plays last season, finishing third worst with 7.6 yards allowed per pass attempt and struggling to pressure the quarterback after losing J.J. Watt and Whitney Mercilus to injuries. Houston’s front seven goes into the year healthy, and will try to test a Pats line that lost left tackle Nate Solder to free agency. Obviously, defending MVP Tom Brady won’t be easy to stop, even without Brandin Cooks, Dion Lewis, and Julian Edelman. The Pats were second in points and first in yards per game last season. While Houston’s defense has deteriorated, they’re hoping QB Deshaun Watson and company can offset that decline. Watson returns from a torn ACL that he suffered two months into his rookie season, but until that point he had a staggering 8.3 yards per pass attempt and connected for a touchdown in nearly one out of every 10 pass attempts. The Patriots defense had several notable losses in the offseason, starting with defensive coordinator Matt Patricia, and the Pats already allowed the third most yards per game in 2017. Not surprisingly, this game had the highest over/under line on the board in the early going. Buffalo had their backs against the wall near the end of Week 17, needing the Bengals to knock off Baltimore in order to get a playoff spot for the first time since 1999. One Andy Dalton pass later, and their dreams came true. The Ravens hope to get revenge at the kickoff of 2018, and quarterback Joe Flacco has been the offseason headliner. The former Super Bowl winning quarterback has been inconsistent over the last three seasons, and finished last year with only 18 touchdowns in 16 games. The Ravens helped him by adding a trio of new wideouts in Michael Crabtree, John Brown, and Willie Snead, while also drafting two tight ends. Of course, they also drafted former Louisville quarterback Lamar Jackson 32nd overall, but the Heisman Trophy winner clearly isn’t ready to challenge for Flacco’s job. Baltimore ranked dead last in yards per pass attempt last season, so it will be interesting to see if they try to show off their new weapons early. Buffalo was successful last season in part due to its turnover margin, which ranked eighth best in the NFL. They did a great job of protecting the ball in a conservative offense, ranking as the second most run-heavy team in football and employing quarterback Tyrod Taylor, who had the lowest interception percentage in the NFL. Taylor is gone to Cleveland, and the Week 1 replacement — second-year quarterback Nathan Peterman — doesn’t look like nearly as great a prospect to protect the ball, after throwing five picks in 49 pass attempts last season. That’s a story to watch, facing a Ravens team that was No. 1 in takeaways last season with 2.1 per game. New $84 million man Kirk Cousins officially begins his Vikings QB career vs. San Francisco. There are high expectations that he’s the missing piece in Minnesota after the team made it to the NFC Championship last year. The 49ers did struggle against the pass (6.9 yards allowed per attempt), so it wouldn’t be surprising for the Vikings to establish their new quarterback early. This game also marks the return of running back Dalvin Cook after suffering a knee injury early in his rookie campaign, though he’s expected to share snaps with Latavius Murray. The 49ers were effective at stopping the run last season, holding teams to less than four yards per carry, but they were also the most rushed upon team in terms of attempts (30.7). 49ers starting quarterback Jimmy Garoppolo is a perfect 5-0 as the team’s starter after being acquired from New England last season, and the offense averaged nearly 29 points per game with him under center. That said, he still threw five interceptions, and Minnesota’s defense, which allowed only 5.9 yards per pass last season (second best in the NFL), could be the toughest challenge of his career so far. Garoppolo does get the aid of Pierre Garcon, returning from injury this season, but the team suffered a tough loss in the preseason when new running back Jerick McKinnon tore his ACL. He will likely be replaced by veteran Alfred Morris on early downs. Despite making the playoffs and winning a playoff game last year, the Titans moved on from head coach Mike Mularkey in favor of Mike Vrabel. Most notable for the Tennessee offense is the addition of offensive coordinator Matt LaFleur and former Patriots back Dion Lewis. LaFleur is tasked with “fixing” Marcus Mariota, who threw for a career-worst 7.1 yards per attempt in his third season and threw more interceptions than touchdowns. The Titans are expected to be more aggressive under LaFleur after having the eighth highest running play percentage last season, and the addition of the versatile Lewis, along with now-healthy second-year wideout Corey Davis, gives them the weapons to do so. LaFleur has stated that he’ll play the “hot hand” at running back this season, so it remains uncertain how much we’ll see of Lewis vs. Derrick Henry in Week 1. Miami’s defense allowed the third most points per game last season due in large part to poor Red Zone defense; the Dolphins sported the fourth worst percentage of opponent Red Zone touchdowns allowed. The Dolphins get Ryan Tannehill back for 2018 after he missed all of last season with a torn ACL, but that’s not the only change on offense relative to 2017. The team is going with Kenyan Drake and Frank Gore at running back, and have replaced Jarvis Landry’s league-leading 112 receptions with Danny Amendola and Albert Wilson. The Dolphins saw solid improvement out of Tannehill in 2016 before he got injured, with a career-best 7.7 yards per attempt, and hope he can pick up where he left off against a Titans defense that allowed more than 245 passing yards per game last season (fifth worst). The Patrick Mahomes era in Kansas City is set to begin. After beating Denver last year in Week 17, Mahomes became the first quarterback the Chiefs drafted to win a game for the team since Todd Blackledge in 1983. It’s an understatement to say that fans are excited for him to replace Alex Smith. Mahomes posted video game-like numbers at Texas Tech, capping off his college career with more than 5,000 yards passing and 41 touchdowns in 2016, and he has a chance to put up big numbers in KC with a group of impressive weapons that include Kareem Hunt, Tyreek Hill, Travis Kelce, and Sammy Watkins. There is reason to be concerned that Mahomes’ arrival will hurt the team’s ball security, however, given his struggles with picks in training camp and Smith’s amazingly low 33 interceptions in 2,436 pass attempts over the last five seasons. KC has won eight in a row vs. the Chargers, most recently thrashing the Chargers on the ground with Hunt (327 yards in two games), so don’t be surprised if the team leans on him again to take the pressure off Mahomes in the season opener. Meanwhile, the Chargers are the Vegas favorite pick to win the AFC West in 2018 after improving to 9-7 last year. Much attention is paid to veteran quarterback Philip Rivers, but the Chargers’ defense was the biggest reason for their success last year, ranking No. 1 in the NFL with only 17.0 points allowed per game. Rivers was effective with 7.9 yards per pass attempt in 2017, and the hope is that second-year wideout Mike Williams and the return of Antonio Gates will offset the loss of injured tight end Hunter Henry. The Chargers will likely challenge a Chiefs secondary that struggled during the preseason, especially if safety Eric Berry is unable to play due to a heel injury. This year could be a make-or-break season for Cowboys head coach Jason Garrett after failing to make the playoffs for the sixth time in eight years in 2017. The task doesn’t get any easier this season after losing Jason Witten and Dez Bryant, and starting the year without Pro Bowl center Travis Frederick. The offense again will lean on Ezekiel Elliott, who has ranked No. 1 in the NFL in rushing yards per game in each of his first two seasons. That won’t be easy against a Panthers defense that allowed less than four yards per carry last year and has a healthy Luke Kuechly in the middle. As for QB Dak Prescott, he’s hoping to rebound after regressing in his second season, particularly with an interception percentage that went from 0.9 percent in 2016 to 2.7 percent last year. Carolina has faced offseason scrutiny of their own. The defensive coaching staff was pillaged for the second straight year, now losing coordinators Sean McDermott and Steve Wilks to head coaching jobs in consecutive seasons. They also have a new offensive coordinator in the seasoned Norv Turner, who hopes to get Cam Newton back to his 2015 MVP form. Turner’s efficient West Coast offense could make Newton, a sub-60 percent passer in four straight seasons, more efficient, if nothing else. A healthy Greg Olsen and the addition of first-round wideout D.J. Moore should be additive, and the team also looks like they will turn 2017 first-round running back Christian McCaffrey into a bell cow back after a heavy preseason workload. The Seahawks make the always-difficult visit to the thin air in the Mile High City after an offseason of major changes. Seattle got a new offensive coordinator in Brian Schottenheimer and lost several notable veterans, including Jimmy Graham, Michael Bennett, Sheldon Richardson, and Richard Sherman. Russell Wilson remains, of course, after throwing for a league-high 34 touchdowns last season. It wouldn’t be a surprise to see the Seahawks offense lean on the run more this season with Chris Carson back healthy, along with the drafting of first-round running back Rashaad Penny. Seattle hopes that tandem can halt the merry-go-round of backs the team has utilized since Marshawn Lynch temporarily retired two years ago. The running game will be especially important to help subdue a healthy pass-rushing trio of Von Miller, Shane Ray, and first-round pick Bradley Chubb. Denver is hoping to get better quarterback play this season with the addition of Case Keenum. It could hardly be worse than last season, when the Broncos had fewer than six yards per pass attempt and threw interceptions on 3.89 percent of attempts, second worst in the league. Keenum had a breakout year in the ultra-efficient Vikings offense last year, completing more than 67 percent of his passes. Denver is also likely to have a new starting running back with former Oregon runner Royce Freeman, who had more than 5,600 yards rushing in college. Ultimately, the team’s success could come down to an offensive line that struggled last year and only made one major change in the offseason by trading for former Cardinals tackle Jared Veldheer. Week 1 will be the 132nd playing of the Turnpike Rivalry between Pittsburgh and Cleveland, of which the Steelers have won six straight. Pittsburgh enters the year as one of the favorites to represent the AFC in the Super Bowl, while the Browns also have high hopes, thanks to significant offseason additions that included Tyrod Taylor, Carlos Hyde, Jarvis Landry, and a host of talented draft choices. One other intriguing story added to this rivalry is Browns offensive coordinator Todd Haley, who took over in Cleveland after being let go by the Steelers this offseason. There’s a common perception that Steelers quarterback Ben Roethlisberger plays worse on the road, but the Steelers still managed to go 7-1 away from Heinz Field last season and 13-5 over the last two years. It wouldn’t be a surprise if the Steelers try to test a Browns secondary that has several newcomers, including Denzel Ward, Terrance Mitchell, E.J. Gaines, and Damarious Randall — especially given that Cleveland’s run defense was their biggest strength last year, allowing only 3.4 yards per carry (second best in NFL). Additionally, Le’Veon Bell could have some rust after sitting out training camp again — if he even returns from his holdout this week. Bell had only 32 yards rushing in Week 1 at Cleveland last year after holding out from training camp. Meanwhile, the key for Cleveland on offense is likely to establish the run and avoid turnovers. The Steelers struggled against the run last season, particularly after losing Ryan Shazier (4.4 yards per carry allowed, fifth worst in NFL), and it remains to be seen if the addition of Jon Bostic will be enough to fill that void. Running the ball should also help protect Taylor from the ferocious Steelers pass rush that finished tops in sack percentage last year (9.8 percent). For all of Taylor’s blemishes, he hasn’t turned the ball over much, with a league-best 1.0 percent interception rate last year and 1.3 percent over the last three seasons. Colts fans will be pumped to see the return of quarterback Andrew Luck after missing all of 2017 following shoulder surgery. Luck has a new set of weapons since he last took the field in Week 17 of 2016, along with a new head coach and offense under Frank Reich. Injuries have been all too common over the last few seasons for Luck, and the front office tried to help by drafting two offensive linemen in the first two rounds of this year’s draft. Similarly, the offensive line has been a major issue in Cincinnati recently (21st in sack percentage in 2017), and the Bengals addressed that area by trading for left tackle Cordy Glenn and drafting center Billy Price in the first round. It would be a surprise if Luck didn’t have some hiccups as he returns from so much time away from the field, but he’s almost certainly an improvement for the Colts after they finished 30th in points scored and dead last in yards per play in 2017. Indy is expected to use a committee of running backs that include Jordan Wilkins, Christine Michael, and Marlon Mack (if healthy), as the Colts try to expose a Bengals defense that allowed the third most rushing yards per game last season (127.9). The Colts are also expected to run regular two tight end sets after signing Eric Ebron in the offseason, joining 2017 Pro Bowler Jack Doyle at the position. But no one on the Colts roster should be happier that Luck is back than No. 1 wideout T.Y. Hilton, who failed to break 1,000 yards receiving last year after four straight years of 1,000+ yards, including a league-leading 1,448 yards in 2016. As for the Bengals, they’re looking for more at the quarterback position from Andy Dalton this year after his completion rate fell below 60 percent last year. In fairness, Dalton has also been running for his life over the last two years, taking a total of 80 sacks. Fortunately for the Bengals, Indy’s sack percentage was the third worst in the league last year (4.65 percent) and rookies Kemoko Turay and Darius Leonard will probably need some time to establish themselves. That means star wideout A.J. Green could have enough time to make big plays down the field, though it should be noted that the Colts held him to only three receptions in last year’s October matchup. Running the ball was also a challenge for Cincinnati last year with only 3.6 yards per carry, but second-year running back Joe Mixon is expected to become the bell cow back and finished out last season strong (256 yards rushing, five yards per carry over his last four contests). Washington and Arizona are both coming into 2018 with new starting quarterbacks. For the Redskins, it’s former Chiefs starter Alex Smith. Affectionately known as a “game manager,” Smith has posted a winning record as a starter in seven consecutive seasons in large part due to his accuracy and conservative passing. His short passes frustrate some fans, but they also have helped Smith to throw interceptions on just 1.4 percent of his pass attempts since 2011, an elite rate. Washington’s success this season might rest on Smith’s arm and their defense, after second-round running back Derrius Guice tore his ACL in the preseason. Adrian Peterson was added to replace him, but the future Hall of Famer was available so late into in the offseason for good reason, after he averaged just 3.4 yards per carry in 10 games last season. The Cardinals were especially good at stopping the run last year, albeit under a different coaching staff, allowing just 3.5 yards per rush (third best). The Cardinals go into Week 1 with veteran Sam Bradford under center and first-round pick Josh Rosen learning behind him. Bradford appeared in only two games last season due to injury, but he should be a good fit for a Cardinals offense that will utilize underneath passes and slot receivers, as Bradford has completed more than 68 percent of his passes since 2015. On the receiving side, adding to veteran Larry Fitzgerald is speedy rookie Christian Kirk, and the team also has star running back David Johnson back after losing him to injury in Week 1 last season. As fantasy football owners can attest, Johnson was one of the top backs in the league during 2016, leading the league with 2,118 yards from scrimmage and 20 scores. We should find out soon if the return of Jonathan Allen and drafting of first-round pick defensive tackle Da’Ron Payne was enough to cure Washington’s awful run defense from last year; it allowed a league-worst 134.1 rushing yards per game and 4.5 yards per carry (fourth worst). NFL fans don’t have to wait long for a heated NFC North rivalry game this season. The Bears are optimistic this season following the hiring of former Chiefs offensive coordinator Matt Nagy as their new head coach, along with the additions of Allen Robinson, Taylor Gabriel, Trey Burton, and new elite pass-rusher Khalil Mack. The offensive additions give Mitchell Trubisky some legitimate weapons this year, and the running back combo of Jordan Howard and Tarik Cohen should also still provide stability in the backfield after averaging 4.2 yards per carry last season (11th best). Green Bay’s pass defense was gashed last year, allowing 7.4 yards per attempt (fourth worst), but the Packers have attempted to address that issue by hiring new coordinator Mike Pettine, signing cornerback Tramon Williams, and drafting two more cornerbacks in the first two rounds this year. Aaron Rodgers is healthy again after playing only seven games last year due to a collarbone injury. He has some new weapons of his own, with tight end Jimmy Graham and a host of rookie wideouts at the end of the depth chart. Gone is Jordy Nelson, who struggled late last year, but Rodgers has still found comfort with Davante Adams, Randall Cobb, and Geronimo Allison. Added this season is tight end and potential touchdown vulture Jimmy Graham. The ultra-productive Rodgers has averaged more than 2.2 passing touchdowns per game over the last three seasons, and the Packers have dominated Chicago in recent history, winning the last four head-to-head matchups and 14 of the last 16. The Bears did retain defensive coordinator Vic Fangio from the former coaching staff, and tried to remedy a run defense that ranked in the middle of the pack last year by drafting first-round linebacker Roquan Smith. The addition of star pass rusher Khalil Mack this week from Oakland adds another significant boost. Third overall draft choice Sam Darnold is expected to get the nod as the Jets starting quarterback. He faces a team in the NFC, but Patriots defensive coordinator turned Lions head coach Matt Patricia has plenty of familiarity with the Jets offense. Darnold isn’t the only new player that New York features on offense this season, as Isaiah Crowell has come over from Cleveland to share running back duties with Bilal Powell, and the Jets also have No. 3 wideout Quincy Enunwa back from injury. The Lions defense ranked in the middle of the pack or worse in nearly every category except for takeaways (where they were second overall) in 2017, and Detroit is also testing a new pair of veteran outside linebackers. Despite a head coaching change, offensive coordinator Jim Bob Cooter remains a holdover from Jim Caldwell’s staff. Matthew Stafford has performed well under Cooter over the last two years, peaking at 7.9 yards per attempt last season. While the Lions have lost tight end Eric Ebron, the solid wideout trio of Marvin Jones, Golden Tate, and Kenny Golladay remains. The team also selected running back Kerryon Johnson in the second round of the draft and signed LeGarrette Blount to try to come up with some semblance of a running game after ranking dead last in yards per carry (3.4) and rushing yards per game (76.3) last season. After rushing the ball only 37 percent of the time last year, it will be interesting to see if Cooter uses more balanced play calling early this season. This year’s Monday Night game of NFL Week 1 features two teams that had arguably the most interesting offseasons of 2018. The Rams fell short in last year’s playoffs after a seven win improvement over 2016, but have apparently decided to go all-in this year with the notable additions of Brandin Cooks, Ndamukong Suh, Marcus Peters, and Aqib Talib. The Rams finished third in points scored last season under new head coach Sean McVay, and running back Todd Gurley was Offensive Player of the Year with 2,093 yards from scrimmage and 19 touchdowns. The No. 1 overall draft choice from 2016, Jared Goff, made huge progress after going 0-7 in his rookie campaign, increasing his completion rate by nearly eight percent and throwing the same total number of interceptions (seven) despite 272 more pass attempts. Meanwhile, the Raiders defense was weak against the pass last year, allowing 7.3 yards per pass attempt (fifth worst) and 241.1 passing yards per game. Oakland also made big offseason changes, including the additions of former Bengals coordinator Paul Guenther, cornerback Rashaan Melvin, and safety Marcus Gilchrist. 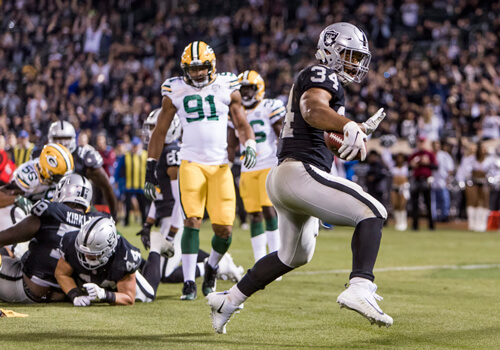 Most notably, star pass rusher Khalil Mack was recently traded away after holding out all preseason, a last-minute change that could severely blemish the Raider defense in 2018. Oakland starts Jon Gruden Era 2.0 after signing the former Monday Night Football announcer to a 10-year, $100 million contract. Gruden is tasked with fixing a scuffling offense, and in particular, reversing the deterioration of Derek Carr at QB. Carr declined in nearly every passing category last season, and his wins as a starter went from 12 in 2016 to only six last season in the same number of games (15). Gruden has been criticized for bringing in several aging veterans in the offseason, all of whom look well past their peak, with Jordy Nelson and Doug Martin the most notable on offense. It’s worth mentioning that both of the Rams’ new cornerbacks (Peters and Talib) have extensive experience facing Carr and the Raiders, as they both used to play for teams in the AFC West. The Rams defense ranked fourth best in sack percentage last year, and the return of lineman Aaron Donald after his preseason holdout will make for a tougher job for the Raiders’ o-line. Ready to use all our best data to get an edge this season? Check out our NFL betting picks, NFL pick’em pool picks and NFL survivor pool picks, or read an overview of our premium content for football.